I found this fun website via one of my readers, Tracy at Loving Pretty Things. Go visit and take their quiz to help you define what your style is. So what would I call that? 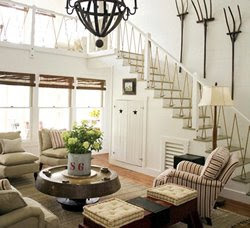 Rustic French Beach Cottage? Ha! What's your style? Don't forget about tomorrow's Frugal Friday Linky Party!!! Come link up with your Frugal decorating ideas! We'll have a great time! Hmm.. I am going to ho over there and find out! I loved taking this quiz! I blogged about it the other day. I am almost the same as you...38% French Eclectic, 38% Nantucket and 24% Cottage Chic. My favorite is the Nantucket style. Oh, I love it (though I did NOT love some of those photos). My style is 50% Classic 25% Nantucket and 25% Traditional Country. That was fun. I'm 60% cottage chic and 40% classic. 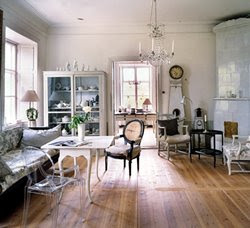 I was 100% French Eclectic, now to find a thrifty way to overhaul my house...any ideas??? That was a fun quiz, I was 33% Nantucket, 33% Wine Country, and 34% Classic. It definately was pretty accurate of my style. I hope you don't mind, but I blogged about it and linked back to you, thanks!! Great fun! I'm Traditional Country...but I would have guessed anything BUT 'traditional'! Thanks for sharing! I was 50% Wine Country, 38% French Eclectic, and 12% Classic. Thanks for sharing - I enjoyed this! When I first took it it said "hmmm that's odd, we weren't able to identify your style" and told me to take it again. Then it said I was "100% Modern Elegance." That surprised me. That was a fun quiz. I posted about it on my blog too! I'm 40% Nantucket, 30% Traditional Country and 30% French Eclectic. I take that back... I didn't read the description! That is me to a T! Well, I'm absolutely in love with every one of those pictures, so I guess I'm right there with ya! Loved the quiz...thanks for sharing! That was fun. I am 67% Nantucket and 33% Classic. Great post! We are sooooo excited about tomorrow! I took the quiz...twice...and both times came out 100% Rustic Revival. LOL!!!! Well now I know. That's just my problem! I love em' all. I could see me in all of those rooms just laughing and enjoying my space. So what do you do when you like everything? You start all over again like what Im trying to do. Declutter....Thanks for this site. I will have to go and try it out. Hope to see you tommorow! Southwest Country Eclectic? Is there such a thing. My husband just calls it Allie Ecletic. I took the test the other day and all I can remember is that I was 33% of something, 33% of something else and 34% of a third something...I better take it again! What an awesome blog!! I love it! lovely pics too... i'd be more than happy if my home looked like any of those! Apparently i am 44% Nantucket,33%French, and 23% classic. Who knew. What a fun little quiz. I took the quiz too,several times, and it is exactly what I have been struggling with for the last few years, I am 70% Mountain Lodge style and 30% Nantucket style OR the exact opposite, 70% Nantucket and 30% Mountain Lodge. Both ways define my style,but my problem is how to blend them both. Thanks for the posting, it was fun to see how it worked for others too. That was fun. At first I thought I wasn't going to like any of the pictures. I'm 33% Cottage Chic, 33% Traditional Country and 34% French Ecclectic. That's pretty much on the money. I'm a Wine Country Style - French Eclectic - Modern Elegance (WCS/FE/ME)...that was so much fun that I blogged about it & linked back to YOU 'cause you're fun too.